Leading New Jersey HVAC, plumbing and electrical company provides tips on how to winterize a home. Mike Agugliaro, co-owner of Gold Medal Service, gives tips on how to prepare your home for winter. Cold weather has arrived and that means spending time indoors, where temperatures are warm. Gold Medal Service, an award-winning heating, cooling, plumbing, waterproofing, and electrical home service company, is offering New Jersey residents some tips to prepare their homes for winter, so the cold air can stay outside and warm air inside, while saving money on energy costs. Cold weather conditions can easily cause further damage to a neglected roof, old windows or clogged gutters. Gold Medal Service recommends that homeowners should try and prevent cold air from leaking into their homes, which will result in less energy usage to keep the house warm. Disconnect and drain garden hoses and sprinkler systems, and place it in a safe storage area for the dormant winter months. Clear gutters to prevent ice dams from forming. Cover outside firewood to keep it dry. Insulate old windows and doors or any crawl spaces where cold air can creep in. Air seal your attic to prevent warm air from inside your home to escape into the attic. Consider installing double or triple-paned windows, or window insulation film, to save money on energy costs. Clean all debris from the roof to extend its longevity. Replace damaged roof shingles as it helps to insulate the house. Run your ceiling fans in reverse (clockwise) during winter. This will gently draw the cold room air up and push warmer air down, distributing it evenly throughout the room. Get a proper thermostat to control temperatures indoors – especially if you plan to go on vacation for long periods of time when set inside temperatures can be lower, which will save energy costs. Check for air leaks in the equipment or duct system of the HVAC system. Change furnace filters regularly for optimal efficiency of the HVAC system. Consider having a professional home service expert evaluate the home before winter arrives. An annual HVAC service and professional cleaning will help maintain the equipment warranty and prolong the number of years homeowners will enjoy their homes’ comfortable climate control system, before it needs replacement. Gold Medal Service now provides waterproofing services, as well as heating system safety inspections. The company is a recipient of the prestigious Dave Lennox Award, exclusive to the top 25 Lennox Premier Dealers throughout the Unites States and Canada. The award is presented to companies that exemplify the highest grade of quality and customer service for Lennox products and more. Gold Medal Service, rated A+ by the Better Business Bureau, was founded in New Jersey in 1994 with just two employees. Their vision was to provide homeowners with a reliable and trustworthy home service company customers could count on to fix just about anything that could go wrong in a home. 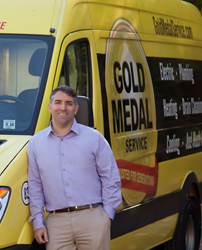 Since then Gold Medal has grown to include more than 150 employees and technicians solving plumbing, heating, cooling, electric, drain, sewer and waterproofing issues for homeowners across the state of New Jersey. Gold Medal Service is a Dave Lennox Award recipient, exclusive to the top 25 Lennox Premier Dealers throughout the Unites States and Canada. For more information, call 800-576-GOLD or visit http://www.goldmedalservice.com.